It’s been developed through millions of years of evolution to help humans deal with challenging situations. It’s often called a “fight or flight” state and, yes, it involves adrenaline but there are all sorts of other hormones in the mix as well. While the exact details of what’s going on can be interesting, we don’t need to go into them in order to grasp the key point: ​what we call music performance anxiety is, originally, a normal and healthy reaction to a dangerous situation. It’s not something ​you need to be worried about. So why does this happen in music performance? All well and good to understand that your body's reaction should kick in if it’s a life or death situation. It’s a bit less obvious that playing music demands such an extreme response, though, even if it’s a high-stakes performance. And some of us will still get these sorts of feelings even for what should be low-key performances. The answer is that your brain can only react to your perception of the world. If ​you view a situation as a threat or a pressure circumstance then your brain reacts accordingly, whether there’s a genuine threat to life and limb or not. There are things that ​you can (and should) work on to change your perception of what a pressure situation is. That’s a topic for another day, though. ​You can still massively improve your experience of performing music without going into that. For now, just know that it’s totally fine if you get this sort of response. Even though it may feel unsettling and uncomfortable, you can actually see it as a good thing as it shows your body is making the normal, healthy response to the situation. It can ​seem like the top ​names in music, sports, etc don’t suffer from this sort of thing, but that’s not really the ​case – everyone gets it to some extent. While it’s true that the intensity of the feeling varies from person to person, there are plenty of greats who still feel ​it strongly. The difference is that they see it as normal and don’t worry about it. The interesting thing about this is that, although the symptoms of ​performance anxiety can feel strange and uncomfortable for musicians, the majority of them actually don’t have any negative impact on your performance. In fact, some of the effects of pressure can be distinctly positive and plenty of top performers rely on this to fuel their performances. For example, David Hemery recalls coming out to defend his Olympic 400m hurdles title in 1972. He was so concerned that he didn’t feel his usual pre-race nerves that he made a desperate bid to gee himself up by digging his nails into his hands. It was too late – despite being the clear favourite, he came in third. Is it all good, then? Most of the ​physical ​effects of music performance anxiety don’t cause any problems. There are a couple which can cause an issue for specific instruments, though. And there is one aspect of the pressure response that’s relevant for any musician. This is the tendency to tense up. Always remember, though, that the aspects of this response that have a negative impact on performance are few and far between. Way less than the number of different symptoms that we tend to worry about. You want to get used to the idea that this sort of response is normal and ok, and nothing to be worried about. You want to stop trying to change that response, or wishing it was different. 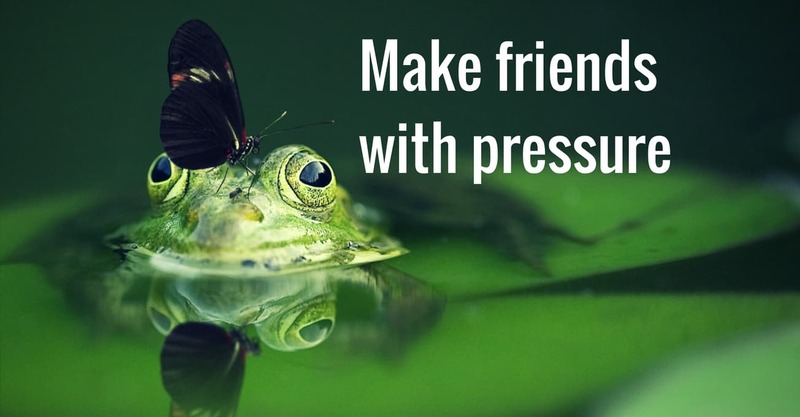 The more that you can accept how you react to pressure, the less it will affect your performance. You may even find that the intensity of that reaction decreases over time once you adopt this attitude. And yet you know that it’s one thing to say you’re going to do this now – another to actually feel like that when the heat is on. Rather than give you a prescription for how to make this work, I’m going to suggest that an easier way to go about it is to learn how to recognise a couple of typical “mistakes”, and how to deal with them. The first mistake is assuming that there’s something wrong with you. If you find that happening, just remember that the reality is quite the opposite – all these symptoms of ​performance anxiety are, in fact, the healthy response. Not showing any symptoms in a pressure situation would probably be more cause for concern. The second mistake is thinking that you should be able to feel calm. This is dangerous because it tends to lead in the opposite direction – the more you try to calm yourself down unsuccessfully, the more stressed you make yourself as a result. While there are things you can do to dial down the energy/stress levels you’re typically not going to achieve a state of total calm even with their help. Now ​​you know that ​performance anxiety in musicians is really a natural response to pressure. It's not a bad thing so the first and most important step is to accept it ​rather than worrying about it. Avoid the temptation to try and fight it, or to wish it wasn’t there. Being relaxed about this is a great help in itself and will also make any future work on changing your perceptions or adjusting your physical responses much easier. It’s not the end of the road, though. When you accept this state of things, you’re accepting that it’s not something that’s ever going to go away completely. That means that if you want to perform at your best you’ll need to learn how to perform in this state. Again, the key is in what we’ve covered here – realising that being in a “pressure” state is not worse than the state you’re used to when you practice. It’s just different. As a result, it’s about getting used to playing in this state. And it’s about seeing it in a positive, rather than a negative light. Rather than “pressure”, think “excitement” or “challenge” instead. What responses do you typically feel in a “pressure” situation and how do you deal with them? Let me know in the comments section below. It has really helped me to think of the fear as excitement. They have a similar feeling in my stomach. Absolutely, Shelley. In fact, the physical symptoms of fear and excitement are pretty much exactly the same. What’s different is the emotion on top. When we get those physical feelings alongside positive emotions then we label it as excitement. When we get the same physical feelings, but with negative emotions then we label it as fear or nerves.